Today Microsoft took the wraps off Microsoft Surface, the smartest coffee table you’ll ever touch. The tabletop is actually a projection screen infrared cameras underneath that track the movement of hands, pencils or virtually any object, allowing you to interact with the computer inside just by making gestures. 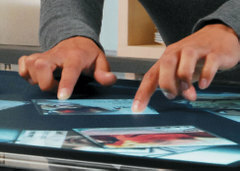 Microsoft has been developing the basic technology for about five years. In our November 2006 issue we covered a version designed for meeting collaboration called TouchLight that resembles the hand-reading screen used by Tom Cruise in Minority Report. Don’t expect to set one of these tables in front of your couch anytime soon, but they will appear in stores, casinos and hotels in the coming months. T-Mobile, for example, will use them as kiosks in its mobile-phone stores. Instead of chasing down a salesperson or reading spec sheets about phones, you'll be able to just touch a phone to the screen, which will read a tag on the bottom of it and display the pertinent details in a bubble next to each item. On the same screen, you'll tap on various rate plans and brush your hand over the table to send the one you like into the phone. For now, the low-res (48-dot-per-inch) cameras can read only special tags designed by Microsoft, but later versions may have the resolution to decipher UPC bar codes, as well as transceivers to read RFID tags. Gee, maybe it'll interface by USB to an Apple iPhone that has a higher-resolultion touch-sensitive surface without a projection unit and is probably more scalable with a greater range of product possibilities. This technology is very different from what apple, hp, and that research scientist "Jeff Han" developped. They only respond to touch this can accomplish far more than those technologies "object recognition is a big part of it"
Apple does have a phone like this but this is much larger and is able to do more....Like finger-paint. So many entertainment for us in the mobile phones.This technology is very different from what apple, hp. I'm absolutely honored, thank you very much - that gives me the drive to keep my blog updated. Article is very interesting and very special. Many thanks for blog owner. yeah it will be great if you guys continue to upload news daily.